It sounds like torture but it's not. You can heal in a small pool lined with live metal electrodes called (unsurprisingly) electric baths. We're just as hesitant at the sound of electricity and water ever mixing, but apparently, it works. 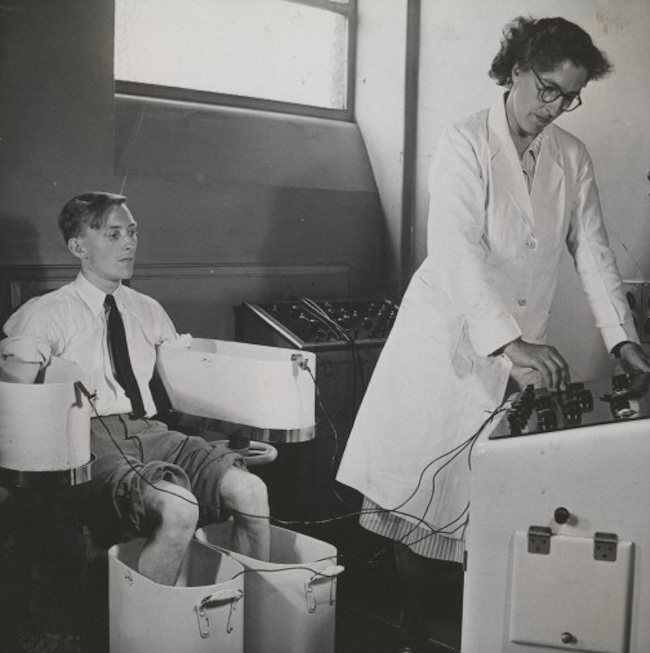 Even if sounds creepy, electrotherapy is not a new method. It has been using in different ways as a medical treatment since 18. century. Basically, it is a use of electrical energy to heal various kinds of diseases as a medical propose. The first recorded medical treatment with electricity has been practiced in London Middlesex Hospital at 1767 via by special device, which also purchased for St. Bartholomew's Hospital a few years later. After centuries, the electrotherapy has become an alternative treatment in a more 'modern' world. In Japan, it became a part of the public bath culture and widely spread around the country since the early 1920's. The Japanese named as 'Denkiburo'. You can still easily find an electric pool in many Japanese baths. The denkiburo's specially designed small pools contain live metal electrodes to pass low-level electric current through the human body. The current induces mild shock causing the muscles to contract, giving a tingling sensation. Even if they're not scientifically proven, the electric baths can provide relaxation from spondylitis, rheumatism, muscle pain and back pain. They even affect headaches, disorders of the nervous system, migraines, arthritis, neuromuscular dysfunction and various other conditions. How much electricity is actually used? "I wandered through the tub area until I located the denkiburo in a corner of the soaking bath. It was a U-shape partition, open at the front. This allowed me to sit just outside it, water up to my neck, while I gingerly extended one hand into the denkiburo, as far from the side-wall electrodes as possible. I didn’t feel much of anything, so I inched forward, putting all four extremities into range. I felt an unpleasant prickling sensation, but it was bearable, so I turned around and began to back my whole body into space. I got halfway in, enduring maybe three seconds of exposure when my entire chest contracted painfully and I was sure death was imminent. I shot the heck out of there. As soon as I vacated an elderly lady moved in, and stayed a good long while with no apparent ill effect." One thing is certain: you should stay clear of electric baths if you have a pacemaker installed or suffer from heart murmurs. If you like to experience this extraordinary treatment on your Japan travel, check the list of Japan baths here.